Tutorial - How to Install Chrome Operating System on Windows, Linux PC. Now you can enjoy Chrome OS on your Computer PC and Notebook. Every tech lover know what is Chrome OS and they want to try it but unfortunately Official Chrome can not installed on and old PC but, Now you can install the open-source Chromium OS software its similar operating system of Chrome OS. Note : Take a full backup of your hard disk data because it will format your hard disk. You can also check out Install Android 6.0 Marshmallow OS on your PC using Virtual Box on Windows. First, Download Chromium OS image and Win32 disk image software from end of post. Then Install Win32 on your PC. Now Extact chrome image. Then burn it to your USB flash drive using Win32. After burn flash drive. Turn Off your PC and boot it from USB. It should take you into chrome setup. From Chrome setup point you can run it live without installation on your PC. Then type sudo su and hit enter, Then it will ask for password enter password and hit enter . Then, It will ask for erase all data like photo, games, songs and all files from your hard. Just type Y and hit enter to continue. Or type N and hit enter to stop installation. Congratulation, Once the installation task compete. 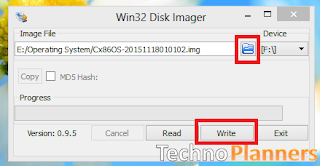 Just Remove USB flash drive and restart your PC. Now Connect it with the internet connection and sign in with your Google Account and enjoy the Chrome OS on your Windows PC.